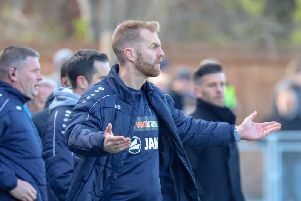 The man whose goals played a huge part in securing Harrogate Town’s promotion from National League North believes that the club have what it takes to succeed in the division above. Dominic Knowles’ brace against Chorley sealed a 2-1 play-off semi-final success and the 26-year-old striker then repeated the trick seven days later as Brackley were dispatched 3-0 and Town progressed to the fifth tier of English football. And having played in both the National League and League Two earlier in his career, the Lancastrian has a good idea of what is to come next season and is backing Town to hold their own. “Of course it will be tougher, but I’m confident that we’ll do well,” said Knowles, who signed a new one-year contract at the CNG Stadium last week. “I think that the top six or seven in National League North would hold their own against the majority of the teams in the division above, but the main difference will be fitness levels. “We were one of only a few sides that were full-time last season and it showed. We’re a good footballing team, but we were much fitter than nearly every other side we played because we trained every day and that gave us a big advantage. “Next season, we’ll be coming against teams who are just as fit. They’ll be bigger and stronger and better on the ball too, but, with the way that we play I think that we are always going to cause problems.